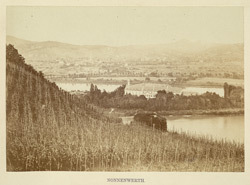 British travelling photographer and publisher of continental views Francis Frith spent 6 weeks following the course of the Rhine and stopping at tourist sites in Switzerland, Austria and Germany. His photographs illustrate scenes from Henry Wadsworth Longfellow's novel Hyperion. Paul Flemming, Longfellow's fictional hero, "had passed a sleepless night at Rolandseck, and had risen before daybreak. He opened the window of the balcony to hear the rushing of the Rhine...The day dawned slowly; and, in the mingling of daylight and starlight, the island and cloister of Nonnenwerth made together but one broad dark shadow on the silver breast of the river." He reflects on the walls of the convent "which now looked forth in the pale morning from amid the leafless linden trees."